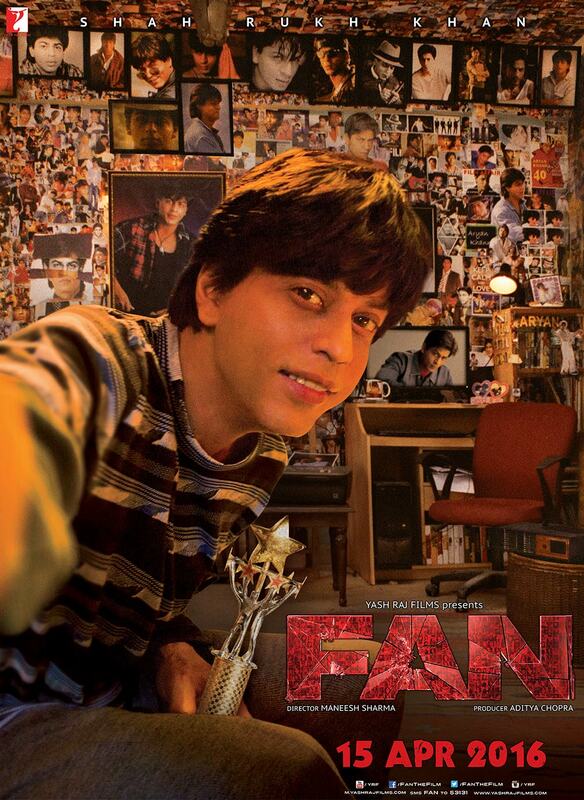 Maneesh Sharma directs Shah Rukh Khan in and as Fan. The story of Bollywood superstar Aryan Khanna and his doppelganger and obsessive fan Gaurav Chandna. What starts as a story of a middle class boy from Delhi’s Indra Nagar who devotes every living minute of his day to his idol Aryan Khanna quickly devolves into a cat and mouse chase through Mumbai, Dubrovnik, London and eventually Delhi. After a series of critical flops which made an absurd amount of money at the box office does SRK redeem himself? After all he is no stranger to playing double roles and he had carved out a niche for himself playing characters with grey shades in Baazigar, Darr and Anjam. There is little to cheer about in this movie so let me get that out of the way first. The make-up and prosthetics on SRK when he plays Gaurav Chandna is exceptional. The use of visual effects to show the younger of the two characters works seamlessly, Gaurav Chandna is skinnier, with a smoother looking face and thinner nose and more pronounced teeth. The older, Aryan Khanna is SRK himself, beefier and with a face that has weathered over time. In terms of acting this isn’t his best performance but it also isn’t his worst. So that is something to cheer about. When he is playing Gaurav Chandna he is at his best as he manages to strike a fine balance between the innocent obsession and a psychotic madness with the lines often blurring. When he is Aryan Khanna he phones it in, there is no nuance to his portrayal and as an audience I couldn’t connect with him. There is no vulnerability, no human frailty just the idea of him being a super hero instead of a movie star which takes away the believability element. That is where the positives end. With a plot like this there is so much that could have been achieved but precious screen time is wasted in three elongated and entirely pointless chase sequences which yield nothing meaningful other than capturing the crumbling south Mumbai building, the picturesque Dubrovnik and the claustrophobic New Delhi. Maneesh Sharma whose first film was the brilliant Band Baaja Barat and the second the underrated Ladies Vs Ricky Bahl has an organic way of directing and storytelling. He was either too overwhelmed to be working with arguably the biggest superstar of Bollywood and he surrendered to the over indulgent nature of showcasing the superstar rather than the story or it was actually someone like Rohit Shetty who directed this one instead. The groundwork that was carefully laid in the first half is wrecked in the second half where two incidents destroy the public image of Aryan Khanna. Clearly the superstar himself isn’t aware of just how much someone like him can get away with. Just cast a glance at the recent tabloid headlines and you have a wide variety of scandals to pick from, leaked pictures (either in the buff or doing lines of the wrong stuff), casting couch, or making controversial statements. It is a literal minefield out there and it would have lent more gravitas to the story and made you feel sorry as you witnessed a slow descent of Aryan Khanna. The chase in Dubrovnik is un-believable and not in a good way. It is a straight lift from the opening sequence of Skyfall and even the music echoes those familiar Bond-esque notes. The Lawyer who accompanies Aryan Khanna to deal with immigration issues becomes a special services agent doing surveillance. In Mumbai no less than 8 police officers risk limb and life to try and capture a perp who isn’t a terrorist or murderer or even on a most wanted list. In London Gaurav takes a train for Dubrovnik from St Pancras and then St Pancras is shown to be Dubrovnik airport. It is gaping plot holes like this which question the sanity of the people behind this movie. The climax is a long SRK monologue and a rehash of one of his more iconic movies’ final scene. A plot with immense potential is rendered impotent by an overindulgent second half, average acting, uninspired dialogue and an overall terrible execution fails to make me a Fan. Shameless product placement for a car giant and even more absurd placement for an international remittance company who get their tag line mentioned not once, not twice but three times make this movie unbearable. A movie that wants to be a study of the psychology of obsession but gets in its own way by trying to be a thriller is a movie best left alone. Rewatch Swades or Chak De instead and reminisce what SRK was capable of.